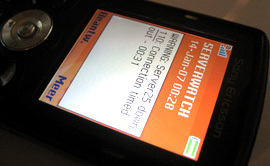 To keep an eye on all our web servers, we have developed Serverwatch. This system checks every 2 minutes if all Web servers are still accessible. When an error occurs, we will be aware within 2 minutes that something is going on. For all our VPS dedicated - and (managed ) colocated -customers this service is also available for free, up to 5 phone numbers and email addresses. Want to monitor your server 24/7? Unable to solve your problem despite this help page? Let us know!